The CoffeeShop Blog: CoffeeShop Soft Autumn Glow PS/PSE Action and Tutorial! CoffeeShop Soft Autumn Glow PS/PSE Action and Tutorial! I am excited to offer a new action and tutorial; CoffeeShop Soft Autumn Glow. This action adds a soft glow and contrast boost, with a subtle yellowish tint and optional vignette. 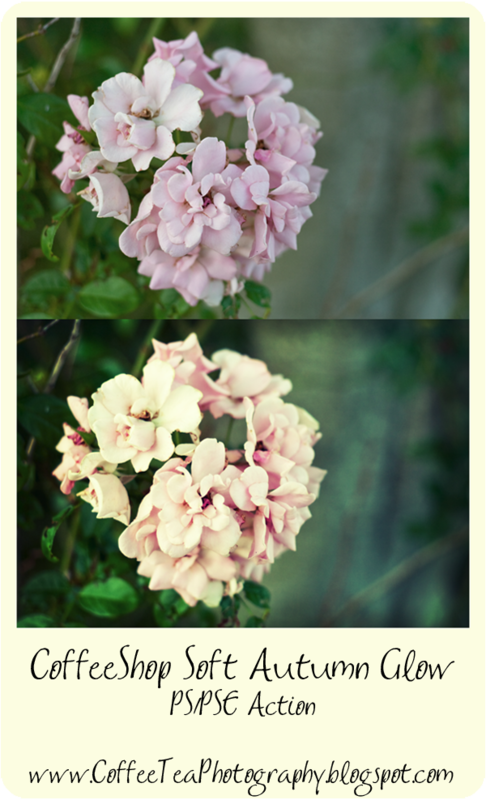 I love using this effect on landscapes and flowers, but you can also use it on portraits and weeds (see below!). Every layer is adjustable. You can turn up the Color Mute layer's opacity to mute the color. The Vignette layer can be turned off or you can adjust the opacity of that layer (put in Overlay Blending mode for a more dramatic vignette effect). The Glow layer can be turned off or its opacity can be adjusted. You can also add more glow during the action run (the Gaussian blur adjustment), but the setting as programmed should work for most of your images since you can dial it down after the action finishes. However, if you are starting with a very high resolution image you might want to boost it up to 8 or 10 (it is set at 5) to get more dramatic glow. Download the free CoffeeShop Soft Autumn Glow PS/PSE Action HERE! CoffeeShop Soft Autumn Glow Action UnWrapped Tutorial! NOTE: This tutorial will only work in Photoshop. You can't edit Advanced Blending in PSE... But don't worry, PSE users can access this hidden feature by running the action! 1. Make 3 duplicates of your background layer. Ctrl-J three times. 2. Double click on the top layer. In the box that pops up, put the blending mode into Overlay, 100%. Then go to the Advanced Blending in the middle and uncheck the B (Blue) in the RGB channels. Name this layer Contrast. 3. Double click on the next layer down. In the box that pops up, put the blending mode into Screen, 50%. Then go to the Advanced Blending in the middle and uncheck the B (Blue) in the RGB channels. Name this layer Golden Tones. 4. Click to select the next layer down (the copy just above the background). Go to Filter, Blur, Gaussian Blur and use a setting of 5 for most images. Then adjust the opacity of that layer to taste and name it Glow. 5. 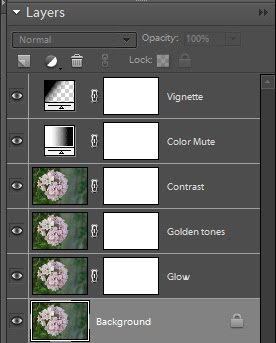 Color Mute Layer: If you find your colors too vivid, add a Black to White Gradient Map Adjustment layer on top of everything and set the opacity to taste. 6. Vignette: Follow the CoffeeShop Burn tutorial to add a vignette. Love this! And thanks for taking the time to break down how you acheive these actions... huge learning resource! Wow, that is simply gorgeous! I'm going to have to try this out! Beautiful action! Thanks so much for both the action and the unwrapped version as well. Awesome! Thank you so much! I have a feeling this is gonna be one of my most favorite actions yet. O Rita this is Awesome!! Thank You SO MUCH!! I cannot wait to try it! How lovely! Can't wait to try it. Thank you so much for including the unwrapped instructions and the screenshot so I can do it myself. Installing the actions is beyond me. Thank you! Your blog post will be advertised on the CraftCrave Tutorials search engine today (look for timestamp: [29 Jan 02:00pm GMT]). Thank you so much for this Freebie. I want to let you know that I posted a link to your blog in CBH Digital Scrapbooking Freebies, under the Page 11 post on Jan. 29, 2010. Thanks again. that is a great tutorial. you help me so much. Hey Rita, snagged a couple actions - you are such an amazing person for sharing your knowledge with us. Thanks for all your hard work - you're the best. Thank you so much for your wonderful actions. I will be donating! Thank you for your actions and tutorials! Learning how to better use PS and PSE is amazing! Thanks for sharing! Just discovered your blog! How resourceful! Learning alot! Thanks for your time and efforts!